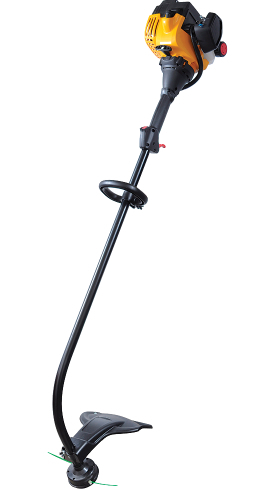 The Bolens string trimmer is designed with only one thing in mind - big box stores and homeowners. The price of these machines is unbeatable, and for the occasional use on a small lawn, it may be just what you need. Keep in mind the long term durability of these units may be lacking, but for an affordable option for a rental property, or a summer home when mowing the lawn is not a regular chore, the Bolens trimmer may fit the bill nicely. Bolens is manufactured by the MTD company. The Bolens trimmer product line consists of 2 trimmers, equipped with the same engines and features. Bolens Model 41BD110G965 is the curved shaft version. The engine is 25cc, two stroke ( which is the most common engine design in the industry today). The flexible shaft drives a bump head, which advances the line when tapped on the ground as the engine is running. No attachments are available, and the warranty is 2 years for homeowner use. The price is unbeatable at $70.00. Look for this bargain trimmer at a big box store near you.